Oliver Steele is a multi-awarded architect and builder with over 15 years of industry experience. His passion for sustainable design and development is the motivating force for Steele Associates, which seeks to be involved with cutting edge Sustainable Development projects as a means of leading the industry to truly sustainable practices. 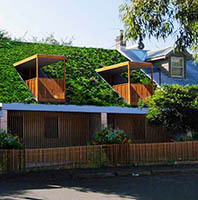 Steele Associates has recently commenced construction of three eco-designed terrace houses in Newtown that aim to bridge the gap between nature and the ever expanding urban environment.